ARCATA – The 16th Annual Godwit Days Spring Migration Bird Festival kicks off with a Dawn Chorus at the Arcata Marsh at 6:30 a.m. Thursday, April 14 and ends at 3 p.m. on Wednesday the 20th with a “casual, wind-down birding trip.” In between are crammed nearly 100 field trips, boat tours and excursions, lectures, and workshops. As of March 31, 17 events had sold out – including field trips to Bear River Ridge, Patricks Point, Headwaters, and Stone Lagoon, several boat tours, and excursions focusing on raptors and owls — but there’s still plenty to choose from. The entire schedule, with detailed information on each event and on-line registration, is posted at www.godwitdays.com. Small groups will be led by experienced guides as far north as Crescent City, south to Ferndale, and east to Hoopa and Willow Creek. There are trips keyed to finding specific birds, such as Marbled Murrelet, Snowy Plover, Spotted Owl, Tufted Puffin, or Ruffed Grouse. If you love water, there are many options: boat excursions on Humboldt Bay and the Pacific Ocean; kayaking on Big Lagoon, Stone Lagoon, Trinidad Bay, Mad River Slough, and Fay Slough; paddleboating on Hookton Slough; and rafting on the Mad River. There’s even an opportunity to bird by bicycle! And not everything is about birds, as there are sessions focusing on mammals, reptiles, amphibians, and plants. On Friday, April 15 at 5 p.m., the free Opening Reception kicks off at the Arcata Community Center. The reception will be followed at 7:30 p.m. by a free lecture by Mark Andre, Deputy Director of Arcata’s Environmental Services Department, on “Two Decades of Habitat Restoration in Arcata.” Bird Fair vendor booths with commercial vendors of birding supplies and informational booths by local nonprofit organizations will be open from 5-7 p.m. Friday, 10 a.m.-5 p.m. on Saturday, and 10 a.m.-3 p.m. on Sunday. Four Master carvers from the Pacific Flyway Decoy Association will be set up and working on projects and be available to answer questions. During these times, live hawks and owls from the Humboldt Wildlife Care Center will be on display, as will the 465 entries in the Eighth Annual Student Bird Art Contest cosponsored by Friends of the Arcata Marsh (FOAM) and Redwood Region Audubon Society. Contest prizes will be awarded at 11:30 a.m. Saturday. Additional events aimed at children are two Kids Birding Trips to the Arcata Marsh (Saturday and Sunday morning), an owl pellet dissection workshop, a drawing workshop, and a family nature crafts session sponsored by FOAM from 12:30-3:30 p.m. on Saturday. Come make a fish print, string a water cycle bracelet, create a peanut butter pine cone bird feeder, put together a wooden bird call, and make a (plastic) eagle talon keychain. Value Package, one-day, student, and family registration plans are available. There are a dozen field trips that don’t require any registration fee, but you must sign up in advance to guarantee a spot by calling (707) 826-7050. The 2011 festival artwork was designed by local artist Rick Kruse. 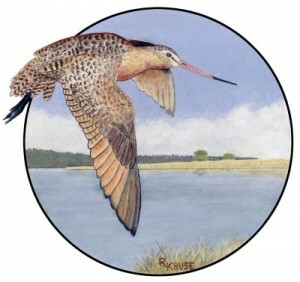 His image of a flying Marbled Godwit appears on the festival poster and T-shirts for sale in the registration area. Come bid on donated goods and services in the Silent Auction area. Visit the Godwit Days website, godwitdays.com to review the event schedule. Registration is available through the website or by calling (707) 826-7050 or 1 (800) 908-WING. This entry was posted on Wednesday, April 6th, 2011 at 12:24 pm	and is filed under News, Community. You can follow any responses to this entry through the RSS 2.0 feed.